This is a little after the fact since this has been sitting in my queue for a while, but here we go anyway! This is why I hate that people think the Zune needs applications to compete in the market. CNET’s prize fight is a little absurd because we have two devices that in reality can provide the same service but really don’t do the same thing. 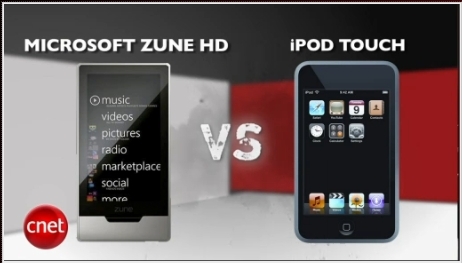 I’ll save you the time…the iPod Touch blows away the Zune HD 4.5 to 4.0 in the 5 round fight. But they’re comparing two different things throughout the fight. I feel like they may as well compare a Zune and a Corvette and dock the Zune points for not putting out 400HP. Yeah sure, they both play music! If you want a device for a little music, applications, games…go get a Touch. If you want multimedia device that’s dedicated to music and video, go get a Zune. They’re just not comparable and not because one is better than the other. If you take away application store out from the Zune equation, and there isn't much you're losing out on, then the Zune is not competing with a Touch at all. But because it has one it does compete. Poorly. In most reviews I’ve seen, including CNET, the Zune wins on sound and screen quality. The navigation is considered on par with the iPod. Some like the Zune better while others like the iPod better but I think everyone can agree both devices are very good on that front and then it’s just personal preference. Both devices are well liked for the physical design. If I’m looking for a portable media player, the Zune just won on sound and picture. If I’m looking for a PDA, I’m getting an iPod.